Before there was James Carville and Carl Rove, there was Michael Deaver, father of the presidential photo-op and stage master to the Ronald Reagan White House. As the Washington Post wrote in last week's Sunday front page obit, Deaver was "the media maestro who shaped President Ronald Reagan's public image for 20 years, transforming American politics with his powerful gift for image-making." NPR On the Media devotes a segment to Deaver in this week's program, interviewing Reagan biographer Edmund Morris (listen to audio above.) In the interview, when asked about the secret of Deaver's success, Morris says that Deaver had an instinct for what was important and what was simple. He realized that a public brought up on television was more impressed with how things looked than how things sound. Ironically, while image craft was his gift to modern politics, it was also his political undoing. 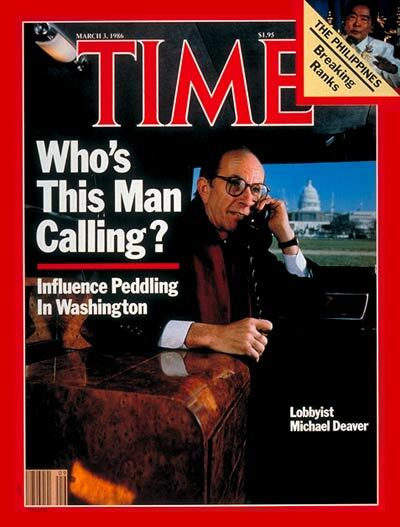 Deaver resigned from his post as deputy chief of staff at the White House in 1985. His resignation came after a photo-op he arranged for President Reagan at the military cemetery in Bitburg, West Germany, drew loud protest from Jewish groups, who called attention to the 49 Nazi SS soldiers who were buried there. He then embarked on a lucrative lobbying career, only to be undone by a Time magazine cover picturing him working the phones as a limousine lobbyist. The cover launched a grand jury and Congressional investigation of lobbying practices by former government officials. Deaver was later convicted of committing perjury during the investigation.